— This article by Jerry Cates, with contributions from John Henry Bartose, Gary Nafis, Jeff Survoss, Jenny C., and Pam S., first published on 4 May 2010, was last revised on 23 October 2013. © Bugsinthenews Vol. 11:05(2). Coral snakes, all in the Elapidae (New Latin elaps = serpent) family, though most diverse in the Americas, are also native to the Asian subcontinent, the Malay peninsula, and the islands of Indonesia. There we find a single genus, Calliophis (Gr. καλλι- “kalli-“= beautiful + -οφις “-ophis” = snake), comprised of 11 recognized species variously native to the Asian nations of Thailand, Malaysia, Indonesia, Singapore, Sri Lanka, Vietnam, Cambodia, Laos, and India. All other coral snakes are native to the New World. In the Americas, three genera — Leptomicrurus, Micruroides, and Micrurus — are recognized to comprise 65 separate species of coral snakes. Two of these, from two genera — Micruroides and Micrurus (the etymologies of these generic names are obscure) — are found in the United States. For the genus Micruroides, in which presently is recognized but a single species (the Arizona coral snake, Micruroides euryxanthus), three subspecies have been identified. Of these, only one (Micruroides euryxanthus euryxanthus: Kennicott, 1860) is represented in the U.S. For the genus Micrurus, two species (the eastern coral snake Micrurus fulvius and the Texas coral snake Micrurus tener) are found in the U.S. Though previously considered as subspecies of Micrurus fulvius, each is now recognized to possess sufficient morphological distinctions to be elevated taxonomically to the species level. All of the serpents in the two genera found in the United States display bright alternating bands of red, yellow (or yellowish white), and black, though only from their nuchal (neck) regions to their caudal (tail) regions. The heads and necks, as well as their tails, display only bands of black and yellow or yellowish white. It is important to keep in mind that if only the tail and/or head of one of these snakes is visible, the observer will not see any red bands and may, at least for a moment, mistakenly conclude they are not looking at a coral snake. The distal extremities (i.e., the tip of the tail, and the head from the nose through just past the eye) of these snakes are always black for the head, and either black or yellow for the tip of the tail. The black head is followed by a yellow or yellowish-white band, followed by another black band. 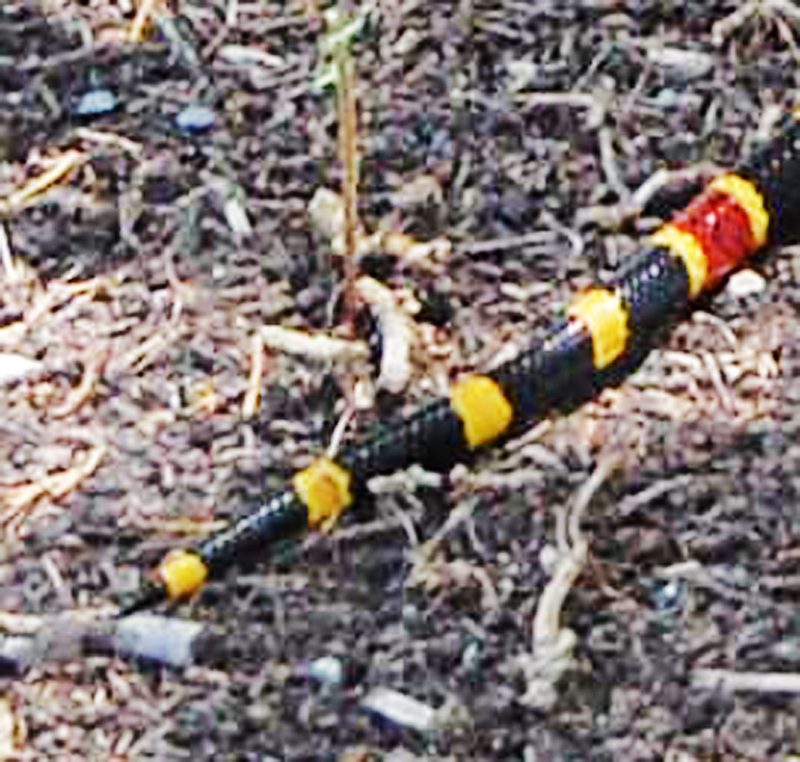 Caudally, this pattern (which begins with either a black or yellow tip) is repeated at least three times for the Arizona coral snake (Micruroides euryxanthus), and four times for the Texas and eastern coral snakes (Micrurus tener and M. fulvius, respectively), before the first red band is produced, always adjacent to a yellow band. For the Arizona coral snake (Micruroides euryxanthus), the head is black from the nose to a point that includes about half of the parietal scutes and generally the entire mouth line, followed by a wide yellowish white band, then by a red band, so that the anterior banding of this species is black-yellow-red. In the eastern and Texas coral snakes (Micrurus fulvius and M. tener, respectively), the head is black to just beyond the eye, enclosing only the anterior edge of the parietal scutes, followed by a yellow band that includes the midmost portion of the parietal scutes, and then by a broad black band that extends from the posterior portion of the parietal scutes and the neck. 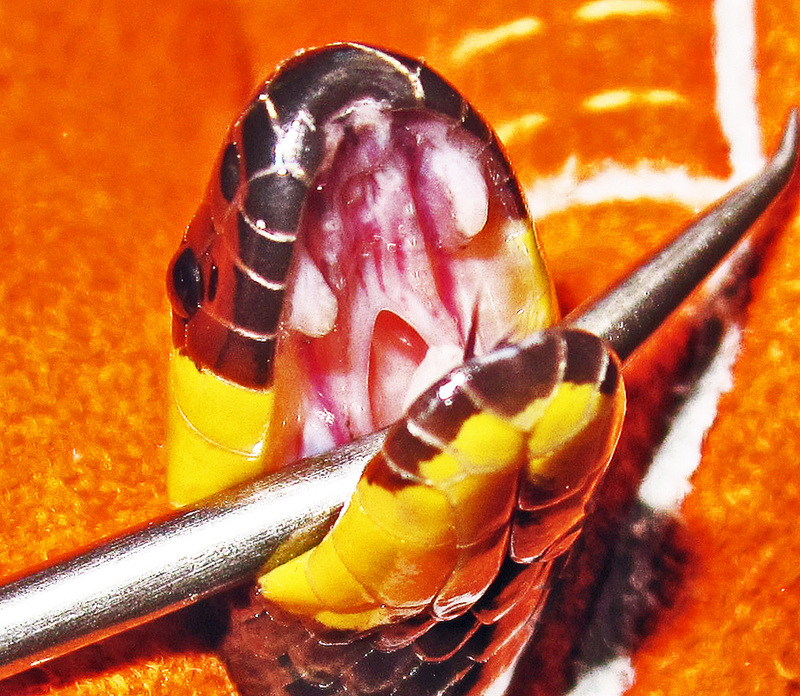 This nuchal black band is then followed by another narrow yellow band, so that the anterior banding of these snakes is black-yellow-black-yellow-red. The red-yellow-black banding pattern of the coral snakes in general makes them highly visible when they are observed in the wild. For many years herpetologists and geneticists debated the mechanisms behind the evolution of such a distinct pattern of bright colors, and the apparent mimicry of those colors and patterns by a number of non-venomous milk and king snakes, mostly in the colubrid genus Lampropeltis. It made little evolutionary sense for either the coral snakes or their non-venomous look-alikes to assume the role of either model or mimic. Batesian mimicry (see my article on Batesian mimicry of pygmy rattlesnakes by the eastern hog-nosed snake), for example, requires a poisonous model that predators avoid once they learn from experience that predation on the model produces unhappy consequences; mimics of the model benefit when educated predators pass them over in favor of less risky prey. However, Batesian mimicry fails when a potential model typically kills its predator (as in the case of avian and mammalian predators of coral snakes, who invariably die when bitten by these serpents). Then it was proposed (Emsley, 1966) that a moderately-venomous serpent known as a false coral snake (Erythrolamprus aesculapii ocellatus: Peters 1868), found in Tobago, supplied an answer. For years it was assumed this serpent mimicked the coloration of the coral snake, but Emsley, turning the tables, postulated it as the model, and coral snakes as the mimics. Because predators of the false coral snake almost always survived, they learned experientially to avoid snakes with its coloration. That education benefited not only coral snakes, but a host of non-venomous king and milk snakes as well. Later, when another scientist (Wickler, 1968) developed Emsley’s hypothesis more fully, he named it after Robert Mertens, a fellow German herpetologist whose studies in mimicry led Wickler to many of his conclusions. At the time he received this honor Mertens was very much alive, but he died seven years later (23 August 1975) when, after being bitten by his pet savanna twig snake (Thelotornis capensis) he mistakenly assumed the bite was not mortal and failed to seek medical attention until it was too late to prevent catastrophic organ damage. 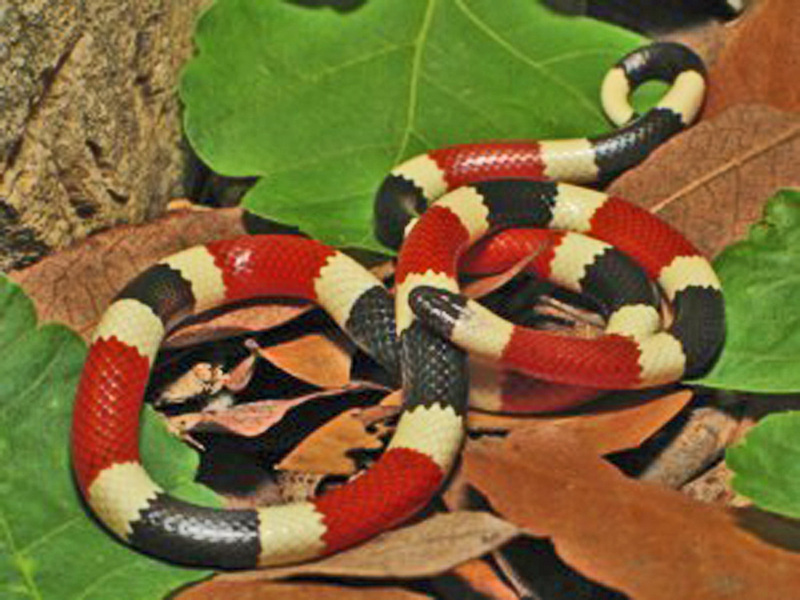 This species varies markedly from the other species of coral snake found in the U.S., chiefly in coloration, in that it has a series of black, red, and yellowish white bands that encircle its body, essentially substituting somewhat spacious cream-colored bands for the much narrower yellow bands observed in Micrurus tener and M. fulvius. Indeed, when Robert Kinnecott — one of the first members of the Megatherium Club — named the species in 1860, he crafted the specific name from two Greek roots (ευρυς “eurys” = wide + ξανθος “xanthos” = yellow) in honor of that observation. Eighteen to twenty five or more yellowish white bands separate alternating red and black bands (each bordered by a white band) that number from 9 to 12 (red), and 10 to 15 (black). The tail is black, as is the anterior head, though the black coloration of the head does not extend to the posterior portion of the parietal scutes. The first band beyond the head is yellow or white. This is the only species found in New Mexico and Arizona with red and black rings that are separated by white or yellowish rings encircling the body entirely. These colors, like those of the Texas and eastern coral snakes, are often, but not always, less distinct on the abdomen. Non-venomous mimics within the range of this species include the Sonoran mountain king snake (Lampropeltis pyromelana) and the milk snake (L. triangulum). This is normally a nocturnal or crepuscular snake, but it is often active throughout the day, particularly during periods of heavy rainfall in the spring, summer, or fall. It hibernates, during the late fall and winter, when it takes over rodent burrows and slips into deep rock crevices. Defensive behaviors are similar to those of the Texas and eastern coral snakes, and include concealing its head beneath coils of its body, popping its cloaca to produce a loud report intended to startle a predator (a skill I have not observed with the Texas coral snake, and that does not appear to be mentioned by other authorities on that or eastern coral snake), and waving its coiled tail in a way that suggests, to a potential predator, that the tail is its head (though some authorities, as reported by Wickler, 1968, have questioned if the head mimics the tail or the tail mimics the head). The strikingly beautiful photos at left were taken by Gary Nafis, the copyright holder, who graciously permitted me to use them here. Viewers are encouraged to visit Gary’s website, Californiaherps.com, to learn more about the serpents and reptiles of California. 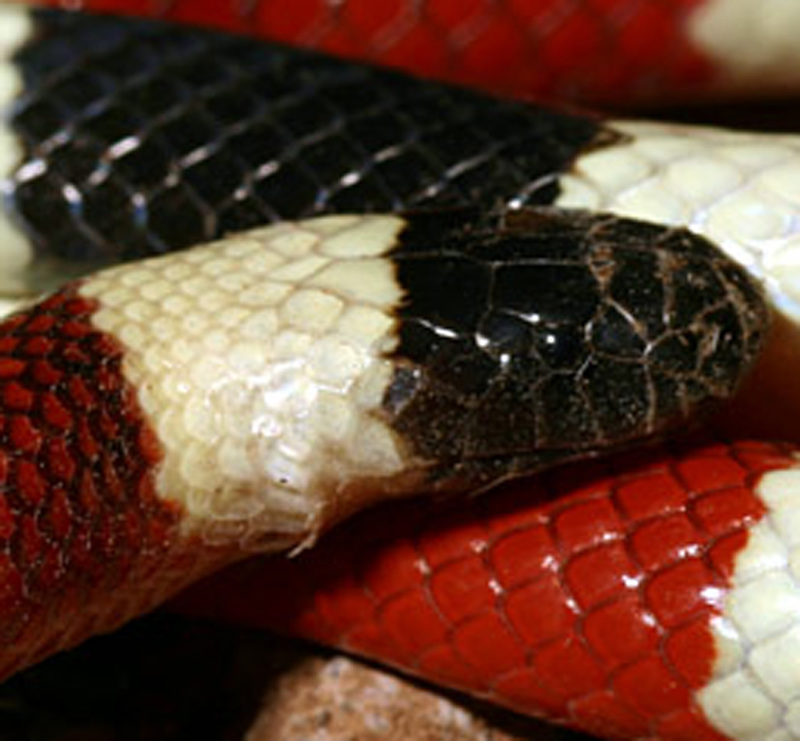 Note the cream-colored bands separating the red and black bands on the snake’s body, and the black head, with the black anterior coloration extending backward onto, but not quite including all of the parietal skutes (the two large scales of the posterior crown). This specimen is apparently preparing for ecdysis — shedding its skin — as the scales on the neck have begun to separate from the body, those of the head are showing signs of separation on their margins, as are those of the mid-body scales. Additional images are being prepared of this species, particularly those showing the details of the caudal markings, including the tip of the tail. Images of this species are being sought at present. The species is very similar to the Texas coral snake (Micrurus tener), but varies from the latter in that among other things, their red bands tend to have two sharply delineated dark spots in their lateral aspects while the red bands of Texas coral snakes tend to have randomly spaced dark spots (some specimens of the eastern coral snake, found in south Florida, have no black marks on their red bands). The black anterior head is followed by a yellow band, then by a black neck band that does not extend forward enough to touch the parietal skutes. 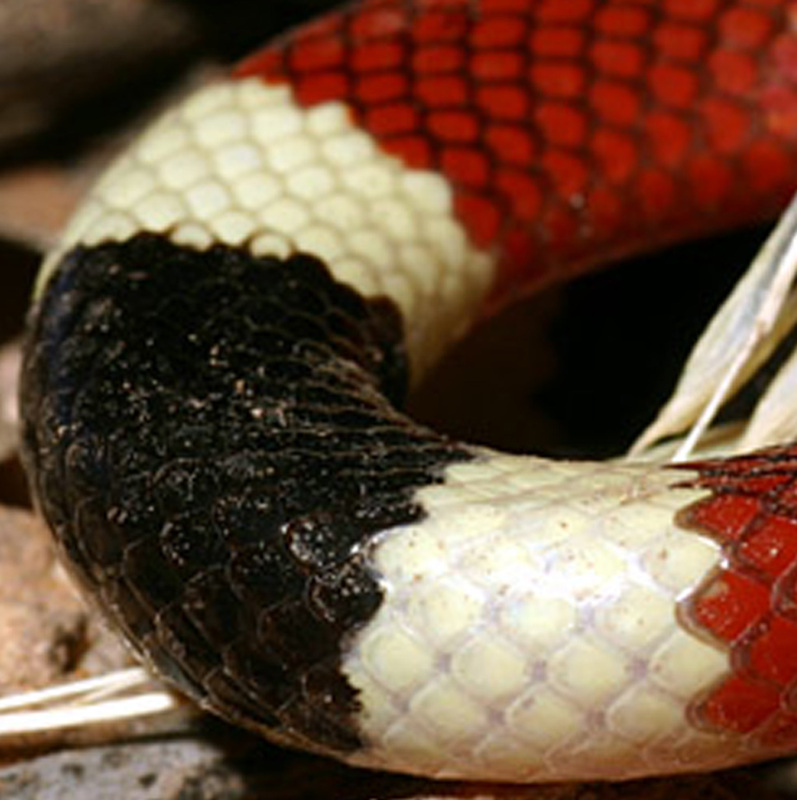 Similar to the eastern coral snake, but differing in that the red bands have widely scattered black spots, not concentrated in regular patterns laterally. As with the eastern coral snake, the anterior head is black, followed by a yellow band, then by a black neck band that, unlike the eastern species, extends forward far enough to enclose posterior parietal skutes. 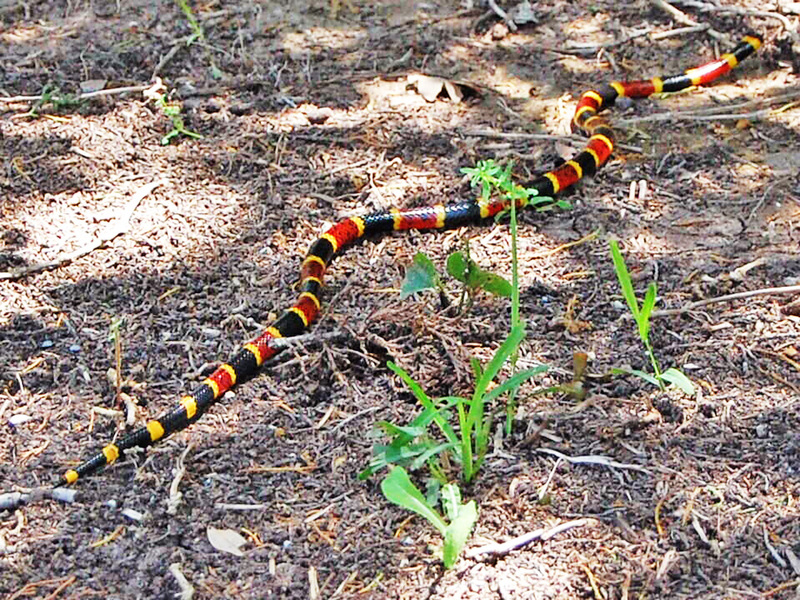 A lady friend of his had found a Texas coral snake in the yard of her home in Dripping Springs, Texas. He promised to hold it for me to photograph the next day. At his friend’s home, I put on a pair of thick leather gauntlet gloves, reached into the cloth sack (after peering in first to be sure what I was about to encounter), and picked up the 24-inch snake shown in the photographs at left and below. Note quickly that this snake has a black head from nose to beyond the eyes (a fact you can verify in later photos posted below), and its shiny “candy stick” body (Conant & Collins, 1998, p.395) adorned with a series of black, yellow, and red bands (“red touch yellow, kill a fellow; red touch black, friend of Jack” is one of the rhymes used to help remember the color scheme that is used to distinguish the Texas coral snake from non-venomous coral snake mimics found in North America), which completely encircle the body. Some herpetologists say this a slightly different way, describing a snake with a basically red background color on which are imposed narrow yellow bands and wide black bands. Others (Tennant, 1998) point out the much narrower yellow bands that separate a series of “12-16 equally broad red and black bands” (though in many specimens, including those depicted here, the red bands are noticeably wider than the black ones). This clearly is a Texas coral snake. Some may question the wisdom of handling a venomous snake, especially one of THE most dangerous snakes found in Texas, rivaled only by the Mojave rattlesnake (Tennant, 1998, p. 91) found in far southwest Texas, south through central Mexico and further west through New Mexico, Arizona, and southern California (Conant & Collins, 1998, p. 413; Werler & Dixon, 2000, p. 393) — at least in terms of the lethality of its venom — with nothing but gloves on my hands. Actually, I’d be remiss if I did not caution everyone who reads this NOT to follow my example. Herpetologists unanimously caution those without experience dealing with venomous serpents that they should NEVER handle them, even with protective gloves. I add my voice to that chorus with gusto. Even though the Texas coral snake cannot bite through tough leather gloves, it is capable of moving its neck and body around rather quickly, and if sufficiently irritated and seeing a bit of bare flesh to bite, is capable of doing so with lightning speed. It is known to behave for a time with absolute docility, then turn on its handler with vicious intent unexpectedly. The first time I handled a Texas coral snake was in 1970, in Leander, Texas, and the encounter was entirely unintentional. I was a 28-year-old systems analyst at Texas Instruments at the time, and my work at TI had kept me so busy I’d allowed the grass to grow too thick around my home’s perimeter. My wife, busy with our two young lads, had wisely left the lawn care to me, though I was remiss in fulfilling my duties. One hot summer weekend, deciding I had to make good on my tardy chores, I started pulling the weeds from around the back of the house. My mind was on computer code, not on weed pulling, and I was not really dressed for the job. I wore sneakers on my feet, shorts that reached almost to the knees, a short-sleeved shirt, and — of course — nothing on my hands. As I reached into the dense growth and clamped down hard on a handful of greenery, a brightly colored snake reached out from the thickest part in my grasp and wrapped itself around my bare, un-gloved hand and wrist. Now, some forty years later, when handling John’s snake I wore gauntlet gloves that covered my hands and forearms, the latter all the way to the elbow. The gloves were specially designed for handling venomous snakes and wild animals capable of biting through normal leather. And, it should be said, I handled this serpent very carefully. One slip, particularly by allowing the snake’s head to get too close to a part of my or someone else’s body part that was not protected by heavy leather glove material, could easily have resulted in a serious bite that required a trip to a medical facility for the administration of antivenin. That same authority goes on to say that though immediate pain usually accompanies such a bite, nervous system impairment (the venom is a neurotoxin) may not be noticed for several hours, and if antivenin is not administered before neurological problems are manifest it may be too late. Let’s continue this post with some words about this snake’s venom and its biting apparatus, shall we? Take a look at the open mouth of this snake, in the photo above, at left. See the white tissue in the upper mouth, aligned just slightly forward of the position of the eyes? This tissue covers the fangs, much as gums cover the teeth of primates, but more thoroughly, like the sheath of a sword. Now, some of the extant literature on this snake species claims that the fangs of the Texas coral snake are very short, grooved structures that are very poor conductors of venom. The implication is that this snake cannot inject its venom into its prey–or into you, should it get the chance to bite you–with efficiency. Thus, we are led to believe, it has to gnaw on you for a period of time while the venom flows by gravity into the wound. All the aforementioned points are true, with the possible exception of the necessity to gnaw on you to inject a serious dose of venom, but they convey only part of the story. It is very unwise to assume as some have done on reading those points, that this snake does not pose a genuine, immediate risk of serious injury, or even death, to a human handler. To help illustrate just how serious a risk this snake can pose to humans, a couple of photos of another Texas coral snake whose cadaver (one of our Texas Legislators, a lawyer by education, called me to say he had killed a coral snake, and was holding it for me to pick up; I shall, albeit with some difficulty, refrain from reciting my favorite lawyer/snake stories here) came into my possession a few years ago have been added to the photo repertoire of this post. The snake, once acquired, has since been pickled in alcohol in my lab (we released the live coral snake that is otherwise featured here, into the wild, where it can go about its natural habits unmolested). Before taking the photos of the pickled specimen’s fang, a scalpel was used to debride the tissue surrounding the left fang. A photo of the left face, from the side, shows how far the diminutive (about 1/8th inch long) fang extends below the upper labial scales. You can also get an idea of how sharp the tip of the fang appears to be. If the fang seems rather blunt, your perception is correct. Unlike the fangs of a viper, those of the Texas coral snake are not fitted with sharp points and lateral orifices for venom injection. However, this feature does not mean that the coral snake has a harder time getting venom into your body: actually, it means it has an easier time of doing so, because unlike the fangs of a pit viper (rattlesnake, copperhead, cottonmouth), the fangs of the coral snake eject venom from their open tips, rather than from slits in the fang’s anterior surface.The tips of the coral snake’s fangs are open distally, vaguely like the tip of a medical-grade hypodermic needle, but not exactly like that, as the tip of a steel hypodermic needle is precisely angled to provide a sharpened point and the tip of the coral snake’s fang is less precise; it’s victims are mostly small serpents with soft flesh that even blunted fangs can easily penetrate. Your soft flesh, by the way, is softer than that of the coral snake’s typical prey, so getting venom into your body isn’t much of a challenge. 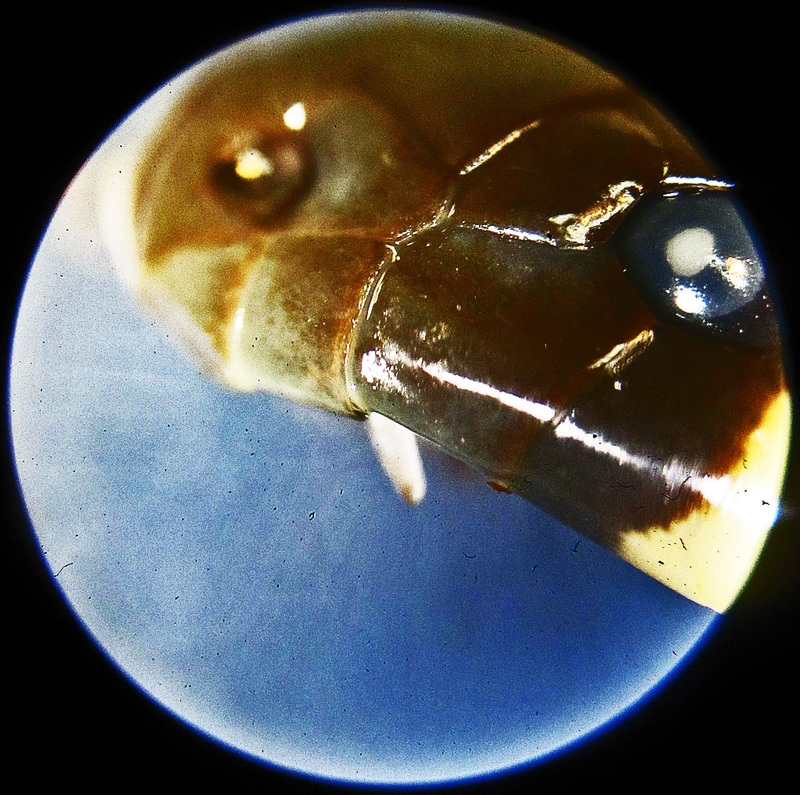 Because of the architecture of the coral snake’s fang, the venom passes directly through the hollow fang and into the deepest extremity of the channel made in the flesh as the fang is pressed inward. 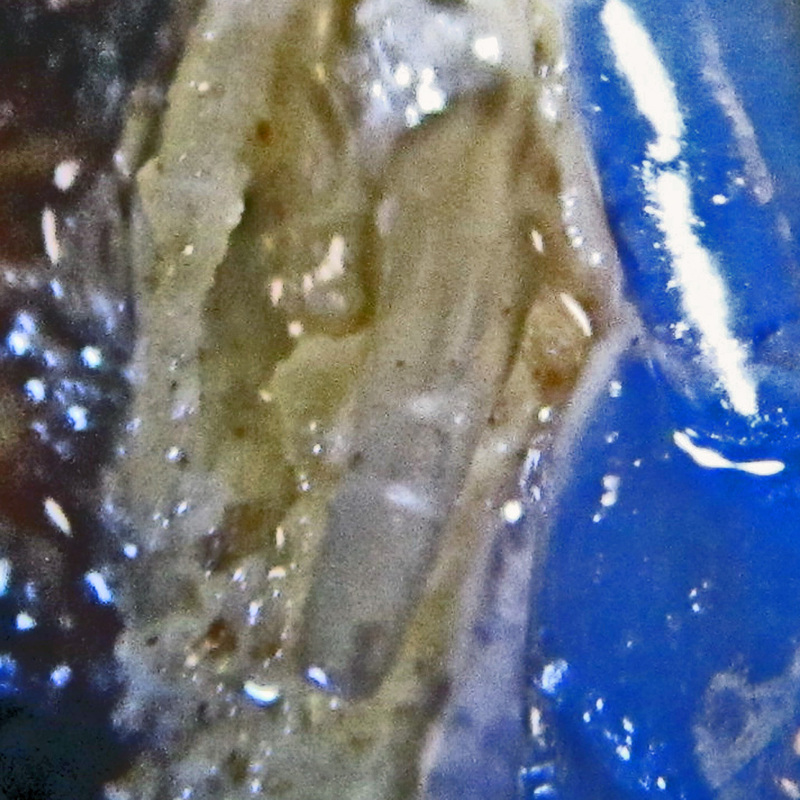 The photo at left is a view of the fang shown in the previous photo, this time viewed ventrally. Notice the venom channel in the fang, and the squared-off tip.Don’t assume this makes the fang less capable of penetrating human flesh. It does not. The snake has strong jaws, and is able to open its mouth much wider than appears possible at first glance. As a result, even a fang merely 1/8th inch long can easily be pressed more than 1/4th inch into human flesh by compressing the latter with the snake’s strong jaws. Even a short penetration into the skin, followed by the injection of the snake’s venom through the hollow fang, can produce serious harm. 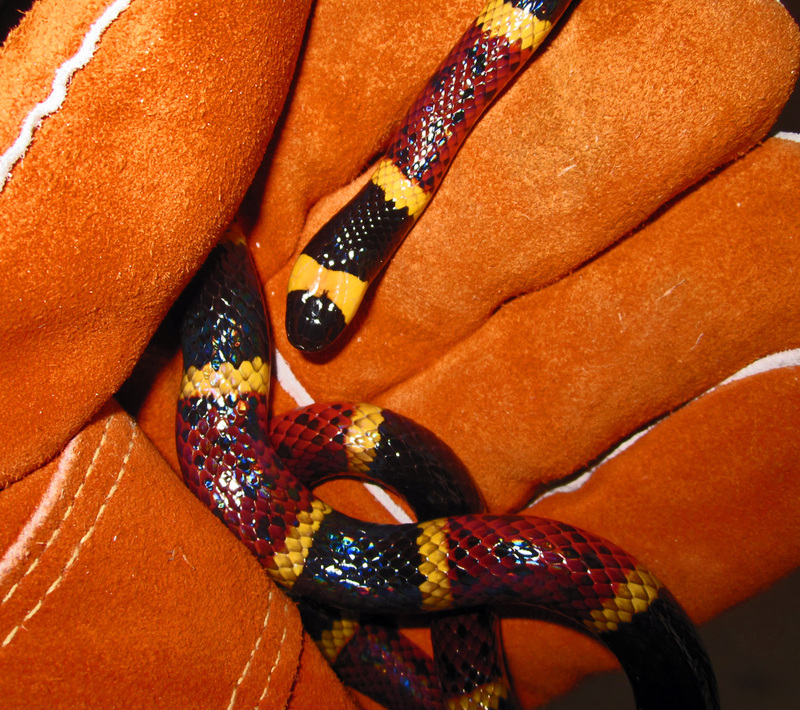 And, it bears repeating that any time a coral snake succeeds in biting a human or one of our pets, the bitten person or pet MUST make the trip to a nearby Emergency Room to be examined by a physician! No exceptions! My husband was out mowing, and told me to get the camera. I got a few shots of this coral snake before he moved off. Thought you might enjoy seeing them. We have a Belton, Texas address, but really are between Nolanville hill and Stillhouse lake off of FM 2410. Nolanville is actually the closest town. I have a healthy respect for all snakes, but enjoy taking photos when I can do so safely. I need to invest in a good zoom lens. A healthy respect for snakes is always a good thing. I’m thinking it may be a good idea to write an article on how best to observe and photograph snakes in the wild. Thanks for moving me in that direction by your comments. Wearing good leather boots overlain with denim is part of the story. Such attire offers excellent protection from snake bites and allows me, for example (my boots have 16-inch uppers) to walk in tall grass looking for snakes without too much concern. I walk slowly, watch the scene unfold before me with care, swing my head side to side to survey 180 degrees, and never step backward into areas I am not presently visualizing. Keep your camera handy, and send more pics when you get a chance. As you can see, the postings on http://bugsinthenews.info cover a lot of territory. Your photos have been added to the post on the Texas coral snake, after modifying that page to make it a general page on the species (a process I’m now following with all the pages on bugsinthenews). I need to go into detail on that page about the mechanics of Mertensian mimicry, as that seems to be the form of evolutionary mimicry that led to the color pattern of our coral snakes (as compared to the Batesian mimicry that led to the mimicry of pygmy rattlesnakes by eastern hog-nosed snakes in the Sam Houston National Forest). Take note of Jenny’s photographs. The black and red bands on her coral snake are not perfectly identical, and in some cases the red bands are not as wide as the black ones, while others are reversed in this regard. Note also that while this specimen has thirteen red bands, it has a total of seventeen black ones, not including the black tip of the tail and the black head. The yellow bands number thirty-one. Pam, who is famous for her Skies of Texas Photography website, sent this photo from her iPhone 4. Although it is a relatively high resolution image, it washes out on enlargement. This is a problem I’ve noticed with a number of photos forwarded via the iPhone 4, and one which Pam — being an expert photog — is no doubt aware. In any case, Julie meticulously included a tape measure with the snake that shows this specimen was slightly more than 25 inches long. I’ve asked Pam if she can get Julie to send me the original image, as it would be great to be able to enlarge it to show some of the salient details. 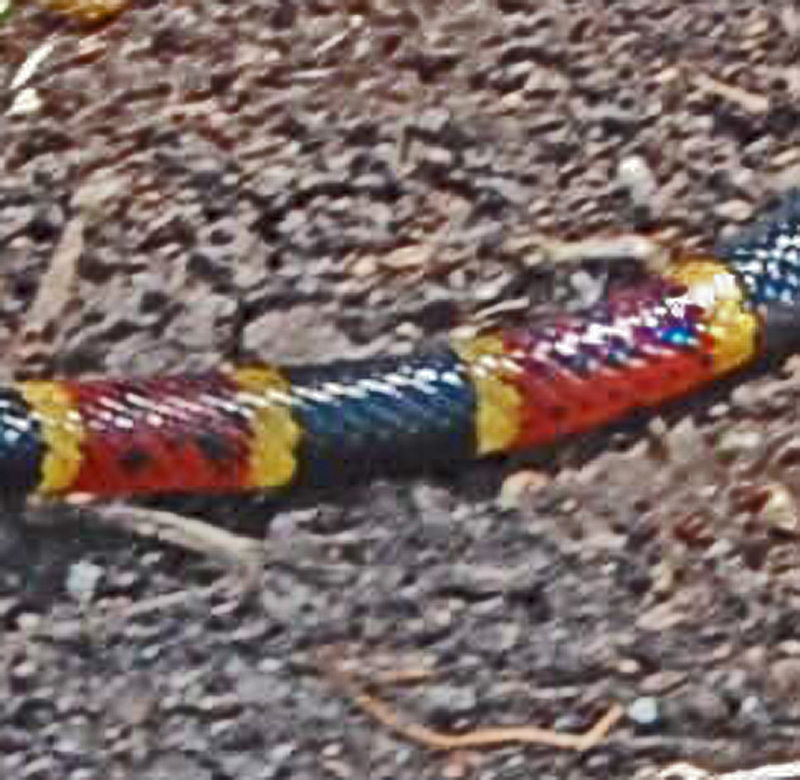 Notice that the yellow rings are quite narrow in comparison with the red and black bands, until the caudal (tail) region of the snake (on the lefthand side of the photo) where the red bands cease and the yellow bands widen to about twice the width represented elsewhere on the snake’s body. This is characteristic of both the Texas and eastern coral snake. Wimberley, Texas, is in Hays County, some 28 miles southwest of Austin, and 46 miles northeast of San Antonio. The city itself is slightly more than 16 square miles in size, all of it land. The town traces its origins to 1848, the same year Hays County was organized, as a trading post established near Cypress Creek. A gristmill was constructed on the site by William Carvin Winters in 1856, at which time the town was named Winters’ Mill. Eight years later, the gristmill was sold to the Cude family, who changed its name to Cude’s Mill. Ten years later, in 1874, it was sold to Pleasant Wimberley, was renamed accordingly, and continued to expand in size and in the mix of commodities that were sold within its walls. Six years later Alfred von Stein established the Wimberly post office. The gristmill remained in operation until 1925. Wimberley is today a popular resort community, known for its healthful atmosphere and its friendly residents. Arikan, H. et al. 2008. Electrophoretic characterisation of the venom samples obtained from various Anatolian snakes(Serpentes: Colubridae, Viperidae, Elapidae). N.W. J. Zool. Vol. 4, No. 1, pp.16-28. Brodie, E. D. III and A. J. Moore. 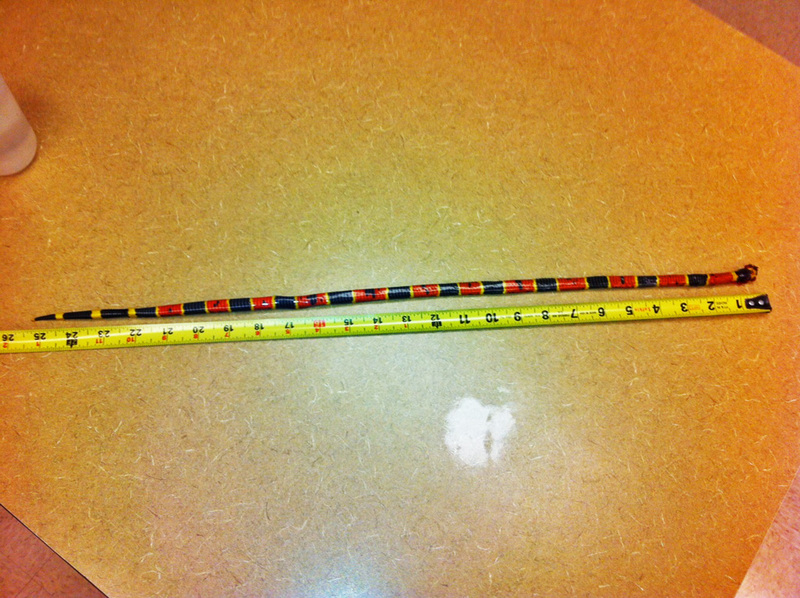 Experimental studies of coral snake mimicry: do snakes mimic millipedes? Anim. Behav. 49:534-536. Brodie, E. D. III and F. J. Janzen. 1995. Experimental Studies of Coral Snake Mimicry: Generalized Avoidance of Fringed Snake Patterns by Free-ranging Avian Predator. Functional Ecology 1995:9 (186-190). Cundall, D. 2009. Viper Fangs: Functional Limitations of Extreme Teeth. Physiological and Biochemical Zoology 82(1):63–79. Deufel, A., and D. Cundall. 2004.Functional plasticity of the venom delivery system in snakes with a focus on the poststrike prey release behavior. Zoologischer Anzeiger 245 (2006) 249–267. Emsley, M. G. 1966. The mimetic significance of Erythrolamprus aesculapii ocellatus Peters from Tobago. Evolution 20 (4): 663–64. Gloyd, H. K., and R. Conant. 1990. Snakes of the Agkistrodon Complex; a Monographic Review. Society for the Study of Amphibians and Reptiles. Grachevca, E., et al., 2010. Molecular Basis for Infrared Detection by Snakes. Nature, 15 April 2010. Harper, G. R. Jr., and D. W. Pfennig. 2007. Mimicry on the edge: why do mimics vary in resemblance to their model in different parts of their geographical range? Proceedings of the Royal Society B doi:10.1098/rspb.2007.0558. Schulz, K., 1996. A Monograph of the Colubrid Snakes of the Genus Elaphe Fitzinger. Koeltz Scientific Books. Weinstein, S. A., et al. 1994.Reptile Venom Glands — Form, Function, and Future. Handbook of Venoms and Toxins of Reptiles. CRC Press. —- Questions? Corrections? Comments? BUG ME RIGHT NOW! Telephone Jerry directly at 512-331-1111, or e-mail jerry.cates@entomobiotics.com. You may also leave a comment in the space provided below. I just found your site and love it! I will be sending stories and pictures now as I run across them. 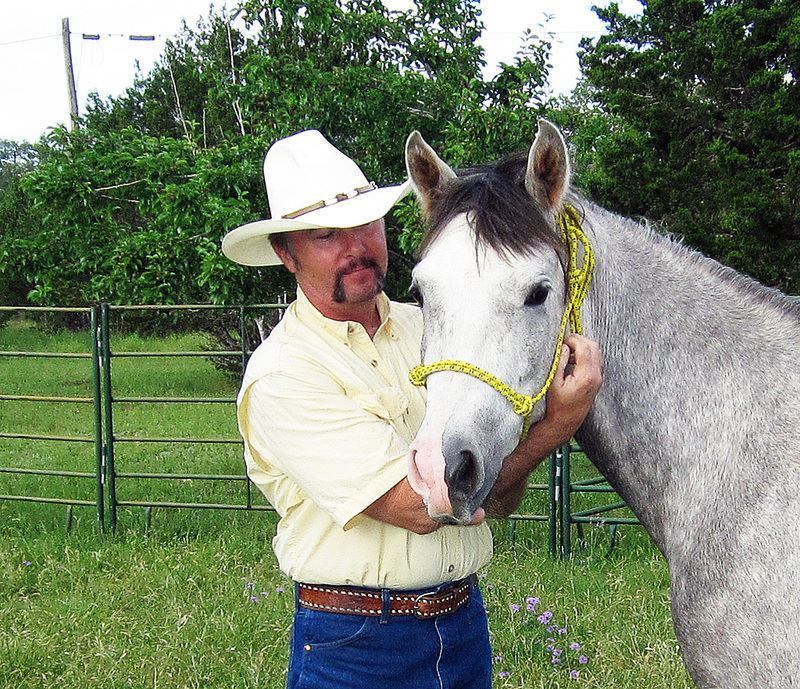 We have found 4 Texas coral snakes and several mimics at the ranches where I trim horses near Conroe, TX. I didn’t know who to contact or what to do with the last one so I put him in the freezer 🙁 Do you have any recommendations what to do with these guys when I find them. I hate to kill them but there doesn’t seem to be any other option. Your stories and photos are very welcome. Around Conroe you will also see the buttermilk racer, which is rare elsewhere in Texas. 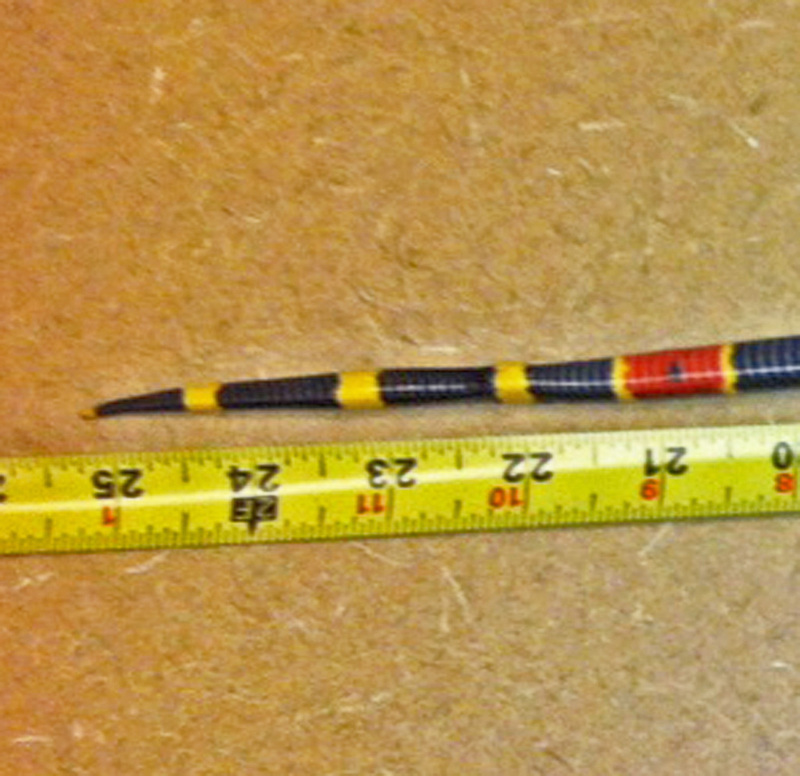 There are possibilities for retaining coral snakes for research purposes. I am preparing a study that will use ten to 12 of that species, which does not harm them but merely studies their behavior. On my next trip to Lake Conroe perhaps we can meet and discuss this.